Let me preface this concert recap by saying that I hope my fifteen year old son never reads this review, because he was dying to come to the Ohel concert but I refused to take him out of yeshiva four hours early just to come to a concert. After all, there are plenty of concerts, right? Well, right and wrong. There are plenty of concerts. But concerts like last night’s The Music We Love are few and far between. In the words of one music industry insider after the concert, “The future of Jewish music took a turn for awesomeness tonight.” What made this concert great was that while it was a mix of old music and new, most of the faces on the stage tonight represent the future of Jewish music and while oftentimes concerts seem stale and formulaic, these performers on the whole, were fresh, energy filled and made it obvious that while there are those who say Jewish music is dying, it is indeed, alive and well, and kicking up quite a storm. The folks at Ohel took a huge gamble when they decided to stage a concert and keep the lineup top secret. Were people really going to spend big bucks to come to a show without knowing who the performers would be? The answer, apparently, was yes, as Mason Hall at the Baruch Performing Arts Center was completely sold out for the annual benefit concert. Unlike most secrets in the Jewish music business, this one actually stayed secret. While people ventured guesses as to the identity of the performers after the final concert ad provided a list of clues, no one except for a select few knew what the lineup was going to be. The venue, Mason Hall, was an excellent choice. The room was appropriately sized: spacious enough that it didn’t feel claustrophobic but small enough to give the room an intimate feel. For those who took the time to look around the room, the architecture was nothing short of magnificent. The concert clocked in at a whopping three hours and twenty three minutes which was definitely too long and perhaps the bags distributed to concert patrons with literature from the sponsors, pens, foam microphones, umbrellas and glow sticks should have included a cheese danish and a frappucino as well, just to tide everyone over. Kudos to Avram Zamist of Sheer Productions for not only putting together a great show but for starting the show just four minutes late, a trend I would love to see continuing in Jewish music. After a video of Lipa Schmeltzer and Eli Schwebel singing at a piano, musically asking the audience to please turn off their cell phones, the night kicked off with an overture based on a Mishpacha Magazine article listing the stories behind some of the most popular songs in Jewish music including Chamol, Yamim al Yemei Melech and Racheim. A voice offstage introduced the emcee for the evening, Nachum Segal, but the stage stayed dark as Nachum was nowhere to be found. A cute video clip showed Segal watching Monday Night Football refusing to come to the concert until concert sponsor Americare CEO, Elly Kleinman, shared the concert lineup with him. Kleinman has quite the flair for comedy and the clip showed the two rushing from Nachum’s house to the venue, finally running down the aisle and appearing onstage together. Pruz was followed by the ever popular Eitan Katz, who sang Yisborach, Boruch Hu and crowd favorite L’maancha. The Ohel glow sticks were waving as Katz told the crowd “it’s not about how many CDs you sell, it is about how many people you touch with your music.” Next up was Eli Schwebel, singing a new song titled Yoga, probably from his upcoming solo album, which was actually quite good. Schwebel then introduced his younger brother Avrumi and his father Rivi, charmingly announced as “Daddy Schwebel” for their first ever joint performance, singing the D’veykus classic In a Vinkele, known to the younger generation as Shwekey’s Tatte. The Schwebels, who also appeared later in the show, are all extremely gifted and were one of the many high points of a show that had many moments of music excellence. Another sponsor bit, this one featuring the grandchildren of the owners of concert sponsor Nutola left Nachum in a bind as he asked one kid after another what their favorite song was and was thwarted each time by responses like “I don’t have a favorite song” and “I’m not a big fan of music.” Finally Nachum had co-host, his son Yosef, read off the next clue and seventy five percent of Shalsheles Jr. appeared as Dovid Dachs, CJ Glicksman and Avrumi Schwebel took the stage singing a Shalsheles medley. The trio was joined by their fathers for the classic Naar Hayisi, and while both Dachs and Schwebel senior are in the music business, Yitzy Glicksman more than held his own and was really quite impressive. A video showing campers at Ohel’s camp Kaylie singing their rendition of Ya’alili was followed by none other than 8th Day and from here on in, the concert picked up steam and never once came back up for air. 8th Day rocked the house with a fifteen minute set that included Shabbos Now, Avraham and Ya’alili, complete with a dancer who was beyond belief. There is no question that the crowd loved them and there is very good reason why Bentzi and Shmuli Marcus are the hottest act in Jewish music today. Next up was Shloime Gertner who just seems to get better and better with every performance as he gains confidence, his sweet personality only enhancing his very impressive voice. Gertner sang two medleys in addition to the beautiful Hashomayim before being joined onstage by the next performer Benny Friedman and the two discussed their musical inspirations before launching into an oldies medley. While Gertner was very enjoyable, at twenty five minutes, his set was too long for a show that had so many performers. Benny Friedman continues to shine and he climbed yet another rung on the ladder of Jewish stardom last night, as once again he nailed song after song. With his slight Midwestern twang, he exudes charm onstage, from his opening moments hugging Shloime Gertner, to his thanking Yitzy Spinner for lending him a tie to wear for the show. Friedman opened with the title track of his album Taamu, then sang the classic Dudu Fischer Elokay before asking the audience to grab their foam microphones and join him in his feel good song Yaavducha. Friedman described his last number as one that “the Jewish people have been singing for 2000 years” and while the audience was expecting a classic oldie, he launched into a sweet, slow version of One Day, giving the audience an opportunity to sing some of the lines before calling out to drummer Gal Gershovsky in Hebrew, “You ready, Gal?”, taking the song to a whole new level. Friedman seems to have taken this Matisyahu song and made it his own, imbuing it with the cheyn that, combined with his never-ending wellspring of talent, makes him one of the most sought after performers out there today. Michoel Pruzansky returned to the stage a second time absolutely nailing the beautiful Shlomo Carlebach classic Mimkomcha, which he dedicated to Elly and Bracha Kleinman of Americare. Next up, it was the Schwebel family again, singing Abie Rotenberg’s Memories, with a slide show of the Holocaust playing in the background. What a group of voices, further enhanced by the way they shared the song, playing off each other. Most touching was Rivi Schwebel embracing his sons at the end of the song, a truly heartwarming moment. I must confess I had never heard Yishai Lapidot, the next performer sing before and I wasn’t quite sure what to expect. But if I had had expectations for Lapidot’s performance, I think he would have exceeded them. Despite the late hour, he had the crowd going wild, singing along with him, waving their glow sticks and clapping along to a medley of his own songs plus a terrific number called Mi Shemaamin. His frenetic energy was contagious and the crowd went wild as Lipa Schmeltzer took the stage and joined him for another medley and Lapidot left the stage to wild applause. Only to return moments later amid more wild applause. While Lipa was dressed in a small brimmed hat and a striped shirt, someone came from backstage and handed Lapidot a metallic gold bekeshe. The banter between the two was hysterical and it is the first time I have ever seen a performer share the stage with Lipa and not be overshadowed by Lipa’s manic energy. The two sang Lipa’s Mizmor L’soda together, with Lapidot more than holding his own against Lipa, not just musically but in stage presence as well and they literally blew the song out of the water. I doubt that this song will ever be performed as well as it was last night. It was just that good. Lipa finished up with a Carlebach medley and a very energetic performance of Hentelach before being joined onstage by the other performers for a finale which consisted of the classic Kol Haolam in several languages and a song I would love to see adopted as a closer at more weddings and concerts, the wistful Naomi Shemer Al Kol Eileh. This was just an amazing show, admirably put together by the very talented Avram Zamist of Sheer Productions, clear proof that Jewish music has a very bright future ahead, no matter what the voices of doom and gloom may be saying. 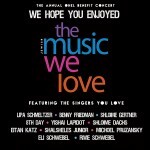 Ohel’s The Music We Love delivered on all counts and if they continue to play their cards right, it is the Ohel show that may soon be considered the one can’t miss show of the year. Stay tuned for a full picture gallery of the show. To see slides that appeared on stage at the concert click here. Sounds like us Midwesterners really missed a parrty! An educated consumer doesn’t buy anything unless he knows what it is. Sounds like it was a solid show, but the whole Elly Kleiman act was so juvenile. Maybe I just don’t have a sense of humor. It would have been nice to see Matisyahu sing with these guys with a reggae twist. That would be a show. This was honestly best show I’ve been to in years. It was really fresh. I kinda liked not knowing who was singing because there were no high expectations. Just people getting on stage and before you start darshening you just get the music straight. Benny friedman and Gertner were the stars. And Benny singing one day was smoking hot. Didn’t Michoel’s third album come out around purim time last year? Yes, his album was released February 28th according to Mostly Music, that’s why I didn’t guess him in the first place.